We are very excited to announce that the macchina of Iso Rivolta and Bizzarini are our 2018 Proiettore Macchina!! The Macchina of Iso Rivolta and Bizzarini have been selected as our 2018 Proiettore Macchina! The Rivolta family has been involved in scooters, motorcycles, sports cars, grand touring cars, as well as yachts and automotive design house Zagato. The Rivolta Family founded Iso that was an automobile and motorcycle maker, the product of Iso Autoveicoli S.p.A of Italy. The company was predominantly active from the late 1940s through the early 1970s. Iso are known for the iconic Isetta bubble car, later of BMW fame, in the 1950s, and for a number of powerful performance cars in the 1960s and early 1970s. The Proiettore Macchina concept was introduced in 2010, the second year of the Cortile. Proiettore, in Italian, is the word for headlight. "Headlight" encapsulates our goal for Proiettore Macchina. We "shine a spotlight" for Pittsburgh Vintage Grand Prix attendees at unique and not-often-seen marques that have a rich and vibrant design and/or racing history. Iso was initially named 'Isothermos' and manufactured refrigeration units before World War II. The company was founded in Genoa in 1939, but was transferred to Bresso in 1942 by Renzo Rivolta, an engineer and the heir of industrialists. Together with engineer Giotto Bizzarrini, designer Giorgetto Giugiaro and chassis builder Bertone, Renzo Rivolta began developing performance cars in the 1960's including the iconic Iso Grifo and which later led to the creation of the Bizzarini 5300 GT. After the Second World War, the company reopened its doors, completely changing its activity. In 1948 it began to build motorcycles, scooters and motocarries (three-wheeled transport scooters/motorcycles). Among the most famous are the Furetto, 1948, 'Isoscooter, 1950, Isocarro, 1951, Isosport, 1953 and the Isomoto in1954. The last ISO motorcycle was presented as the ISO 500 in 1961. Isomotos were known as expensive, but durable and well-built. In the mid-1950s, Rivolta started to develop a miniature car for two persons and front entrance, initially with only three wheels, later, for reasons of stability, with four wheels (the two on the rear very close together): the Isetta Bubble Car. About 20,000 of the bubble cars were built at the Iso works near Milan. Starting in 1954, Isetta was licensed to automobile manufacturers in several countries: France (by VELAM), Spain, Great Britain and Brazil, by Romi. The most successful, however, was the German Isetta built by BMW. The BMW-Isetta went on to dwarf the production volumes of Iso and become one of the best-selling German microcars in the 1950s and 1960s. About 130,000 had been sold by 1962. Together with engineer Giotto Bizzarrini, designer Giorgetto Giugiaro and chassis builder Bertone, Renzo Rivolta began developing the Iso Rivolta IR 300, which was first presented at the Torino Show of 1962. It was an elegant 2 + 2 Coupé with well-balanced technical components and outstanding driving performance. The 5.4 L V8 Chevrolet Small-Block engine and the transmission came from General Motors in Detroit, and the de Dion suspension and four-wheel disc braking system came from the large Jaguars of the time. This concept was maintained for almost all production cars of Iso. Starting in 1971, Ford 351 Cleveland engines replaced the GM small block. 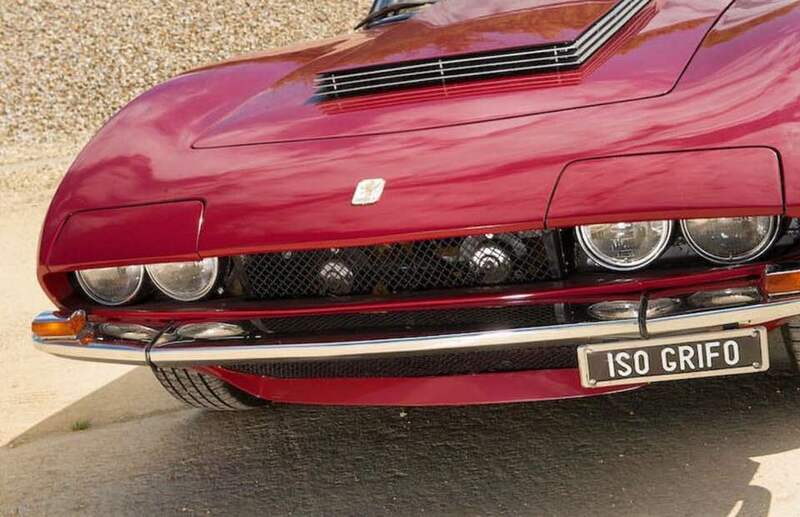 Iso's most well-known Gran Turismo automobile was the Iso Grifo which featured a low-slung, sporty berlinetta body by Bertone. After Bizzarrini left the project, this prototype formed the basis for his own Bizzarini 5300 GT. The Grifo Prototype was further refined by Iso, receiving a reworked, less aggressive and more luxurious body in the process, and went into production in 1965. The Grifo was powered by Chevrolet´s 327 cubic inch (5.4 litre) V-8 producing either 300 or 350 hp. In 1966 a convertible version of the Grifo was shown, but never reached production. Starting in 1968 the Grifo was also available with Chevrolet's 427 cubic inch big-block V-8; this version was known as the Grifo 7 litri and was easily recognized by the broad air inlet on the hood. Later-day Grifos, the Series II, featured concealed headlights and a slightly modified front area. After the sudden death at Milan on 20 August 1966 of Renzo Rivolta, his son Piero became the director of Iso, aged only 25 then. Under Piero's leadership, Iso built the limousine Fidia, "the fastest four seats on wheels" (Advertisement, 1967) with body by Ghia, the Grifo 7 litri (with the GM V8 7 L marine engine) and the 2 + 2 fastback Coupé Lele (1969) with body designed by Bertone, intended as the successor to the IR 300. Iso went bankrupt in 1974, only 1700 Iso Gran Turismos had been built in those ten years.